Bafana Bafana’s turnaround under Shakes Mashaba has been remarkable. They have managed what looked impossible – qualification for a tournament with a game to spare. South Africa qualified for Afcon 2015 comfortably as they went unbeaten in a group which included the defending champions Nigeria. There are a number of reasons for Bafana Bafana’s turnaround in fortunes but none more so than Andile Jali. Largely ignored in the past two years prior to Mashaba’s appointment, Jali has been the significant difference between Gordan Igesund’s side and Shakes Mashaba’s side. Jali represented South Africa at the 2009 Under-20 World Cup in Egypt, and made his Bafana debut against Zimbabwe in January 2010. The fact that he only collected 15 caps between his debut in 2010 and July 2014 (a period of four and half years) is a topic for much debate. In that same period he was a crucial member of 2 consecutive treble winning campaigns with Orlando Pirates. His exploits in the PSL eventually landed the dynamic midfielder a contract with Belgium side KV Oostende in January 2014. Jali started the first 5 of Bafana Bafana’s 6 qualification games and was an important cog in the Mashaba machine that went unbeaten. He was kept in reserve for the final game against Nigeria and although South Africa went into the half time break 1-0 up, the midfield struggled to stamp their authority on the game. Only poor finishing from Ahmed Musa and excellent goalkeeping from Darren Keet allowed Mashaba’s men to lead at half time. It was abundantly clear; Bafana’s midfield were missing it’s talisman. Jali was introduced late in the second period as Bafana Bafana held on to a 2-2 draw. The former Orlando Pirates players’ contribution over the first 5 games was impressive. Jali is widely regarded as a defensive midfielder but that definition does not do his vast natural ability justice. Indeed many underestimate Jali’s ability to dictate play when his side are in possession and keep the play ticking. Bafana Bafana now play the game through Jali. He collects the ball from the centre backs and then builds possession and creates play. His link up play, movement and ability to find space was a marvel to watch through South Africa’s qualification campaign. He is always available to collect the ball, seems to have more time on the ball than most and with nothing complicated orchestrates all that is good about Bafana’s play. A quick review of Jali’s Prozone stats in the five qualification games he started confirms what was evident to the naked eye. In Bafana Bafana’s opening and impressive 3-0 away win against Sudan, Jali registered four out of four ground duels won and six out of eight tackles won. This highlights his hard work off-the-ball or the ‘dirty work’ as it is so often referred to. Orlando Pirates supporters’ became accustomed to this during his time with the Soweto outfit and his ability to break up play is what Jali became synonymous for. However the aspect of this game which has developed well over recent times and for which he perhaps does not receive enough praise for, is his ability to dictate play. In the same game Jali successfully completed 41 out of 51 passes (80% success rate). Importantly this included 20 out of 24 successful forward passes (83% success rate). Jali was at the heart of an exuberant and new Bafana Bafana. The diminutive midfielder only grew from strength to strength through the qualification process. He picked up the man of the match award with a powerful display against Nigeria in the second qualifier. Jali effectively neutralised John Obi Mikel by keeping tight to the Chelsea midfielder for most of the game. Mikel was unable to penetrate forwards and although Jali did not win as many ground duels and tackles as in the first game his presence often forced Mikel backwards. This particular performance portrayed Jali’s intelligence off-the-ball in relation to his positioning and his tactical understanding of the game requirements. The former Pirates number 15 once more delivered two impressive performances against Congo (home and away), but it was in the penultimate qualifier against Sudan where his qualities really shone through. Starting with the defensive aspect, Jali once again made the most tackles by any Bafana player winning 6 out of nine 9. His midfielder partner, Dean Furman, was successful in 2 out of 2 tackles. It was in possession though where Jali was at his supreme best during this game. He made 84 passes overall with 71 successful (84.5% success rate), with 36 out of 47 forward passes finding their men and eight out of 12 passes into the final third proving accurate. Furman registered 61 passes in this game. The stats display that Jali often makes the most passes and tackles for Bafana Bafana – an ultimate work horse. In the game against Sudan, Jali ran the show, pulled the strings and was a crucial figure in South Africa’s 2-1 victory. 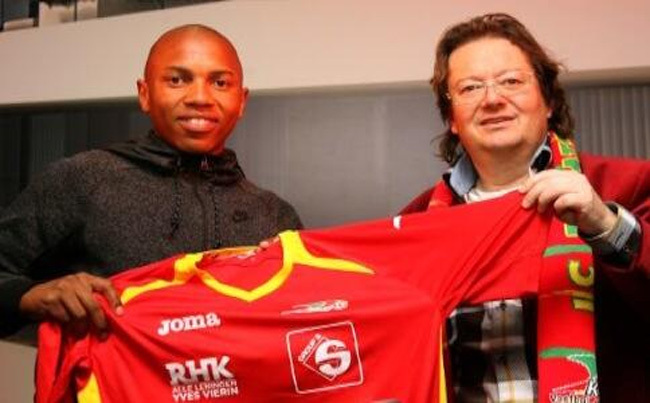 Jali signed for Belgian Jupiler Pro League side K. V. Oostende in January 2014. The KV Oostende midfielder has formed an effective partnership with Dean Furman in the centre of Bafana Bafana’s midfield. Jali’s work-rate and ability on the ball and off has proved fundamental to Shakes Mashaba’s plans. He has been the fuel which has allowed Mashaba’s machine to function at full tilt. For years South Africa has yearned for a midfield general; a general who can take the initiative and lead Bafana with commanding performances. While Jali gains experience and enhances his game in Europe there is no reason why he can’t be Bafana’s midfield general for many years to come. South Africa has been drawn in the group of death at Afcon 2015 along with Algeria, Ghana and Senegal. South Africa may have qualified unbeaten but this group will certainly put Mashaba and his charges to the test. Jali’s impressive performances during the Afcon qualification campaign may only be the beginning of a budding romance with the national team. For if Mashaba’s fairy tale start to his second stint as the national team coach is to continue, he will require Jali to continue to grow and provide regular commanding performances at the heart of midfield. Ebrahim Sadien is a Serie A and Italian football writer who also covers Bafana Bafana and local South African football.